Private, beautifully designed apt. 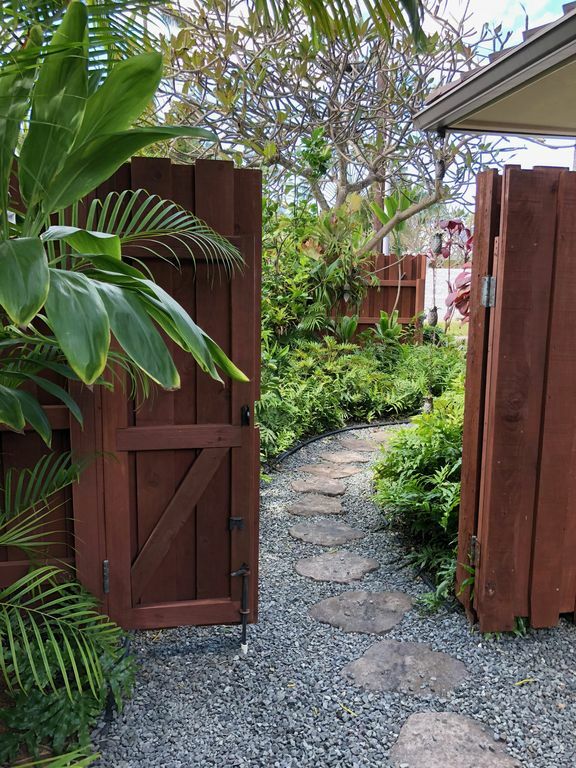 close to Kailua Beach, perfect for couples. 1 Bedroom Apt, King size bed, air conditioning, full bathroom, outdoor shower. Ginger Hale, is a professionally designed, custom built, very private high-end, air conditioned one bedroom upstairs apartment. You have your own private motorized entrance gate that leads to your off-street parking and apartment entrance. Ginger Hale is located beachside Kailua (ocean side of the last street before the beach) 80 steps to the beach access. Returning from the beach you will enjoy the outdoor shower with hot water! You will find a new dishwasher, washer and dryer, and cooktop plus a full-sized refrigerator. Your private garden sitting area is complete with eating area a Weber gas grill. We provide your paper goods, detergents, beach towels, hair dryer all you need is your bathing suit and sunscreen. Come for a visit. The first time we drove into Kailua we knew this is where we wanted to retire. We bought our home is 2002 and moved here in 2007. We love living so close to the quiet end of Kailua Beach. Nothing better than waking up at sunrise with a cup of coffee and a stroll on the beach. Tub/shower combination with a view of palm trees. Large counter and mirror with plenty of towels and a hairdryer. Built in washer and dryer. Washer and dryer are within your apt. Private gated parking right beside your entrance. Living room area has a love seat, recliner and side chair plus coffee table and side tables, wall mounted TV. Nice and large for helping with cooking. Granite counter tops with custom cabinets. Eating area for 4. Garden with a table and umbrella. Rental available within a mile. Private sitting are on the ground level. Table with umbrella. Golf courses within 6 miles. Beach Chairs, Boogie Boards, Beach Towels, Paper Products, Detergent, hair dryer.